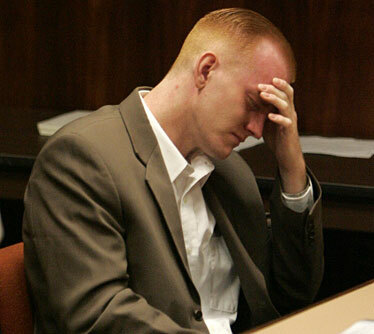 Kirk Lankford, convicted of the murder of visitor Masumi Watanabe, reacts as he is sentenced to life in prison. Calling him a predator and a danger to the community, a state judge sentenced Kirk Matthew Lankford this morning to the mandatory life prison term with the possibility for parole for the murder of missing Japanese visitor Masumi Watanabe. Lankford, 23, admits his handling and disposal of Watanabe's body was heartless and wrong. However, he continues to declare his innocence. "I'd like to say again, I did not kill Masumi Watanabe." Lankford claims Watanabe, 21, died April 12 last year when she jumped out of his moving truck and hit her head on a rock. "Twelve members, men and women, of your community here in Hawaii did not believe you," said state Circuit Judge Karl Sakamoto referring to a jury verdict earlier this year. Watanabe's parent also said they do not believe Lankford's claim that he disposed of their daughter's body in the ocean. "I will not be able to forgive you for my entire life," said Hideichi Watanabe, Masumi's father through an interpreter. The Watanabe family believes Lankford buried Masumi's body somewhere on Oahu. "Even after all of this, we still bow humbly to you, to beg and plead to show us some way that we can return her remains to her hometown in Japan," said Fumiko Watanabe, Masumi's mother. It will be up to the Hawaii Paroling Authority to determine how much time in prison Lankford will serve before he is eligible for parole. The Watanabes said they will return to Hawaii for every hearing. Lankford claims he accidentally struck Masumi Watanabe with his work truck as she was walking on Pupukea Road. As he was driving her around the area to find out where she lives, he said Watanabe jumped out of the truck, striking her head on a rock and died. He said he didn't report the incident and disposed of the body out of fear of losing his job.